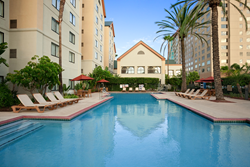 Homewood Suites by Hilton Anaheim Main Gate welcomes Natural Products Expo West® exhibitors and attendees to the Anaheim Convention Center March 11th through 13th. Expo events include early morning yoga, Boulder brands breakfast, Evenings on the Plaza, Women in Naturals networking event and much more. Attendees can also check out the newest products from their favorite natural, organic brands. For more information, please visit http://www.expowest.com. Located just five minutes from Anaheim Convention Center, Homewood Suites by Hilton Anaheim Main Gate is perfect for business travelers, families, extended-stay vacationers and everyone in between. Within easy walking distance to various dining and entertainment options, Homewood Suites is just one short mile to Disneyland® and ten minutes to the Honda Center, for guests looking to explore Anaheim’s entertainment options. With amazing amenities, comfortable suites and much more, the Homewood Suites works to ensure guest satisfaction in all areas. Guest amenities include: full kitchen in all suites, complimentary hot full breakfast daily, evening social Monday through Thursday nights, business center, free Wi-Fi, Disney Shuttle service and more. A guest favorite, the Welcome Home® reception, Monday through Thursday nights, is complimentary and offers a variety of light appetizers and drinks. Guests may relax in this all-suite hotel, with king or dual queen suites, as well as, accessible rooms available upon request. For more information or to make reservations, guests may call (714) 740-1800 or visit http://www.homewoodsuitesanaheim.com. The Homewood Suites by Hilton Anaheim Main Gate hotel is proudly managed by Stonebridge Companies in Denver, Colo.